With visionary faculty and generous donors, we are fortunate in the Division of Engineering and Applied Science to be able to quickly adapt our educational programs to the evolving directions of our research programs. This year, two exciting undergraduate initiatives are underway: the new undergraduate option in Information and Data Sciences (IDS) and Robotrack, a constellation of new and existing courses that brings CS, EE, and ME faculty together to train students in the combined areas of mechanical systems, electrical and electronic components, and software and control. 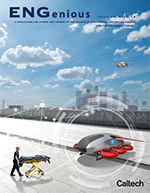 IDS and Robotrack together cover the field of autonomous systems very broadly, are reflective of our research thrusts in autonomous systems and computational thinking, and give our students the opportunity to learn from the uniquely interdisciplinary teams of faculty pushing multiple boundaries in these fields. 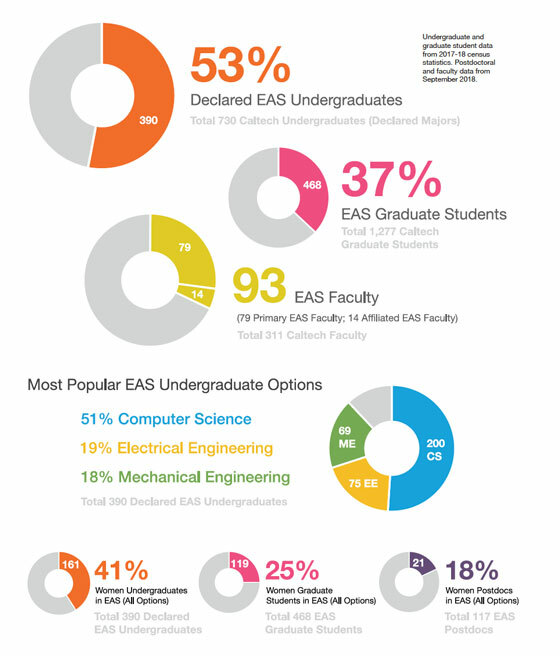 IDS draws upon traditional areas that span computer science, applied mathematics, and electrical engineering, including a range of contemporary topics, such as machine learning, network science, distributed systems, and neuroscience—all areas in which Caltech is growing, with our recent faculty hires. The centerpiece of the Robotrack program will be cross-curricular challenges through new project-based courses. These challenges will allow students to gain knowledge and skills by working together for an extended period of time to investigate and respond to authentic, engaging, and complex real-world problems in robotics and autonomy. Our new state-of-the-art laboratories and facilities, such as the Center for Autonomous Systems and Technologies (CAST) and the EE undergraduate labs, as well as Caltech’s new high-performance computing cluster, bring necessary additional infrastructure. As my colleague Joel Burdick (Richard L. and Dorothy M. Hayman Professor of Mechanical Engineering and Bioengineering and Jet Propulsion Laboratory Research Scientist) explains in “Smart from the Start: Studying and Building Autonomous Systems” in this issue of ENGenious “It’s not like we can open up an engineering textbook and say to our students, ‘Go build an autonomous system.’ We have to build that together, from scratch.” Bren Professor Anima Anandkumar from the Department of Computing and Mathematical Sciences challenges us with her observation, “I see right here, right now, the opportunity to shape the fundamental framework of this field—one that will come to define the theory of autonomy.” Our faculty are joined by Caltech trustees Lynn Booth and Kent Kresa, who have supported this vision by endowing the Booth-Kresa Leadership Chair for CAST. In addition, the gift of a leadership chair for Mechanical and Civil Engineering from alumnus Cecil Drinkward (BS ’50) and his wife, Sally, has further strengthened our ability to soar in several areas including autonomous and robotic systems. Leadership chairs provide discretionary funds for center and department leaders to bring resources to exciting new ideas very quickly—and they are transforming the reach and pace of what Caltech educators and researchers can achieve. Through the profiles in this issue, I invite you to meet two of our alumni, Jennifer Dionne (PhD ’09), who is a professor at Stanford University, and Julie Eng (BS ’89), who is the executive vice president and general manager of 3D Sensing at Finisar in Silicon Valley. Both offer inspiration and insight into the transformative power of a Caltech education—and each has developed a career rich in interdisciplinary challenges, with opportunities to change people’s lives for the better. Deep curiosity, together with the desire to invent and to make the world a better place, continue to guide our efforts in EAS, as they have for decades. Please visit campus when you can—and stay in touch. As always, I look forward to receiving your thoughts and comments.